Things to Do in Budapest in June shares with you a long list of interesting events and fun things to do in Budapest to welcome this favorite season. Budapest in June is marvellous, the city rocks with all kinds of events and fun things to do everywhere around. In June Budapest hosts lots of festivals, concerts, open air theater and all sort of outdoor activities to do for locals and tourists alike. Budapest weather in June is warm, not too hot, days are much longer, very sunny and bright. Temperatures rise and the whole landscape shines in summer colors. Despite of the warmer weather I recommend you bring a light jacket for chilly nights, sunglasses and suncream. Do not forget your bathing suit, as you shouldn’t miss the thermal baths nor outdoor pools!! Please find below our top picks’ list of things to do in Budapest in June, you might be interested in doing what locals do and going where locals go besides sightseeing while visiting Budapest. On the first weekend of June, the Belfest is taking place in the heart of Budapest, more exactly you will find stages around Erzsebet tér, Szabadság tér and Zrínyi utca. This festival is completely free of charge and open to anyone who would like to enjoy concerts of jazz, pop, rock, folk music and to have a great time with relatives and friends. There will be playgrounds for children, fashion shows and dance performances, all in one premise. How to get there: The best way to get to Belfest in Erzsebet tér is taking Blue Metro Line (M3) and getting off at Deák tér station Erzsebet tér is just in front of Deák tér. When: Every Friday and Saturday Night of June, 2015. From 10:00 pm to 4:00 am. It opens its doors every Friday and Saturday night to enjoy a quiet spa experience. Visiting Rudas baths at night can be a unique thing to do in Budapest in May. In 2014, Rudas Bath went through an extensive renovation resulting in a brand new wellness area with four new pools and a rooftop terrace and a rooftop pool. You will also find a Reastaurant & Bar that caters a Turkish-Hungarian fusion kitchen. The Budapest Summer Festival is the city’s most important musical event of the season and one of the festivals that offers the best variety of things to do in Budapest in June. –The season opens on Margaret Island with the Liszt and Dante concert on June 12 – the National Philharmonic conducted by Zoltán Kocsis. –This year’s great opera production will be Károly Goldmark’s monumental Opera Queen of Sheba on July 3 and 5, a joint production with the Hungarian State Opera organized by Csaba Káel. –On July 10, Carl Orff’s 120th birthday, the Szeged Contemporary Ballet and the Dohnányi Orchestra will present a special production of the Catulli Carmina and Carmina Burana, ballet with a grand orchestral accompaniment. The guest star sensation of the Vive la France! Symphonic soundtrack-concert to commemorate the 100 birthday of Edith Piaf, will be announced by the organizers. –Keeping with the tradition, on June 5 and 6, Puccini’s Tosca will be sung by the French mezzo-soprano Béatrice Uria-Monzon, and Cavaradossi will be sung by the young Chilean tenor, Giancarlo Monsalve. –On August 22, the founder of the Gipsy Kings band, Chico & The Gypsies arrives. Budapest Summer Festival offers high quality folk, jazz and world music performances as well as renowned operas during the month of June until the beginning of September. More information:Check the Budapest Summer Festival website for detailed information on performances and tickets. -Farnace Antonio Vivaldi. Opera in three acts. June 12, 14, 18 and 20, 2015. -Il Trovatore. Giussepe Verdi . Opera in four acts, two parts. June 19, 2015. -Kamarazov Brothers.B. Eifman / S. Rachmaninov. Ballet in two acts. Érkel Theater. June 20, 21, 24, 25, 27, 28, 2015. How to get there:You can reach the Opera House easily using the yellow metro Line 1. There is a station right across the Opera house , as you come up the station the opera House is just in front of you on Andrassy út 22. The Érkel Theater is located just in front of the Opera House. When: Every Tuesday and Sunday of June, 2015. 8:00 pm. Every year and every season Budapest’s Museums have their own feast, The Night of Museums. The summer festival of Budapest Museums will offer you a wonderful opportunity to visit as many museums as you want and enjoy a night full of cultural events and programs. 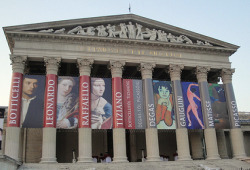 Each Museum organizes unique functions and exhibitions. This year there will be actually 2 nights to enjoy all kind of cultural events. On Night of Museums, your museum entry ticket will work as transport ticket as well on regular Budapest Public transport from 4 pm until 5 am. Special museum buses will be running between the venues as well. More information: Check the Night of Museums website for detailed information on tickets,transport, programs and participating museums. The bazaar takes place at Gozsdu Udvar, a beautifully renovated courtyard on Király utca (Budapest Jewish Quarter). If you are looking for something fun to do on Sundays, Gouba bazaar is the place to be. If you happen to be in Budapest at this time, don’t miss this festival! Take advantage of this fair to look for unique souvenirs for relatives and friends..
How to get there: The best way to get to WAMP in Erzsebet tér is taking Blue Metro Line (M3) and getting off at Deák tér station Erzsebet tér is just in front of Deák tér. The musicians, members of the Zoltan Kodaly awarded Hungaria Orchestra, as well as the world famous violinist Zsigmond Vidák entertain guests with melodies of classical and traditional Hungarian music as they witness fabulous night views of Budapest at the background. If you are interested in any type of art, visit Budapest’s Palace of Arts and enjoy Hungarian’s rich cultural life.This is truly one of the things to do in Budapest in May you shouldn’t miss. More information: Check Palace Arts Events for detailed information on current programs. Vörösmarty tér, Margaret Island Open Air Theatre, Vajdahunyadi Castle, Museum of Ethnography, Budakalász, Üröm and Györ. The Danube Carnival is the perfect event to get familiar with Hungarian culture, traditions and art. This multicultural event will delight us all with world music, ethnic and contemporary dance shows, folk dance and music, contemporary dance,symphonic and brass music as well as art exhibitions and gastronomy festivals. 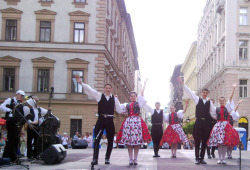 In addition to the Hungarian traditional and professional dance groups, the carnival will incorporate many European performers from outside Hungary as well as guest ensembles from overseas. The traditions of the Visegrad Countries are also in the highlights. On occasion of the 20th anniversary the Carnival will offer a special program series, will also incorporate the most successful productions, artists, music and dancing troupes of the past two decades. At 80 different programs nearly 2000 artists are performing at 12 venues. In Budapest, some of the venues where the festival will take place are: Vörösmarty Square, Margaret Island Open Air Theatre, Erkel Theatre, Pesti Vigadó and Duna Palace. More information: Check the Danube Carnival website for detailed programs and dates. This festival is one of the coolest things to do in Budapest in June for children. June is the Children’s month in Hungary, and in Budapest children have their own festival. Every weekend weekend of June, families with children head to Obuda Island (Hajogyári Sziget) to enjoy countless activities such as concerts, games, sports, family events, music, theater and more. If you have children and will be in Budapest in June, bring them to have a great time at the Obuda island. More information: Visit the Children Island official website for directions and detailed information on activities. You can reach János Hill by chairlift (libegő in Hungarian). More information: Check the map at the Hungarian Transport website for detailed timetable and prices. Where:Romai Part, Budapest III district. Romai Part is a charming riverbank in Budapest’s District III. It is a popular place for dining, strolling around, riding your bicycle, renting a kayak or a boat and sailing along the Danube. There are lots of terrace restaurants where in summer locals enjoy the cool breezes of the Danube as well as Hungarian summer delicacies such as langos, palacsinta (pankakes) and fried fish (hekk). If you are willing to spend an afternoon as a local and with locals, come to Romai Part. How to get there: take the HÉV train from Batthyány tér and get off at Római Fürdő station. Walk to the riverbank. Alternatively, you can go by boat, public boats operate from April to October, you can take the boat at Batthyányi tér dock and get off at Romai Fűrdő dock. To get back to the city check the timetable at Romai Fűrdő dock. Where:From Budapest’s Docks to Riverfront in Óbuda (Romai Part), Budapest III district. If you want to enjoy a ferry ride along the Danube, just the way locals do, take one of the ferries that run from Petőfi bridge (Boraros tér dock) to Pünkösdfűrdő dock. This is a very nice tour that covers the lenght of the city and costs you a little bit more than a metro single ticket, all depends on where you get on and where you want to get to. There are stops at Batthyányi Tér and Jászai Mari tér where you can get on and there is also a stop at the Margaret island where you can get off and look around if you wish. I recommend you take the ferry at Petőfi tér then you will have the opportunity to take beautiful pictures of the Chain Bridge, the Buda Castle and the Parliament. Get off at Romai Part stop, stroll around or if you wish just go until the last stop (Romaifűrdő)where the ferry turns back and takes you where you to the Danube’s banks in the city. Tickets are sold on board. More information: Check the map at the Hungarian Ferries website for detailed timetable and prices. Know about Fun Things to Do in Budapest in June? Let me know! and share with others. Do you have any question about any event or anything related to your trip to Budapest? Let me know!, I will be happy to help you! More things to do in Budapest in June coming soon….